Technical Car Experts Answers everything you need: Ford Escape Air flow selector not working and Air blows from defrost vent only? Very common issues,noticed on many branded vehicles including fords.Its a vacuum related issues. 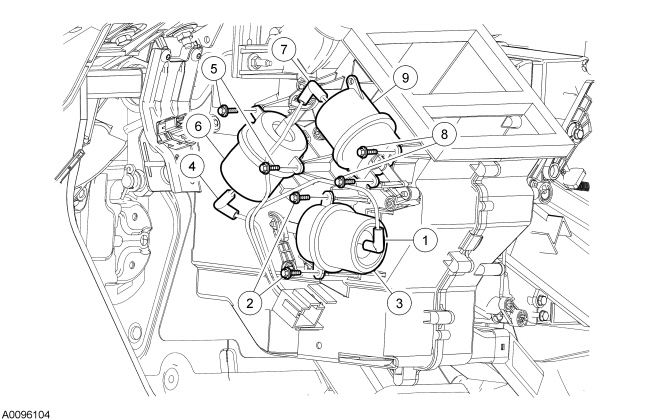 First understand the working procedure of car ac system on your ford escape. Your a/c system uses vacuum from the engine to move vacuum motors under the dash to direct air flow in the vents, when there is no vacuum it default to defrost , so open the hood and look on the passengers side fire wall for a thin black vacuum line going into the fire wall into the cab , make sure this vacuum line is in tack, no brakes or cuts , then it goes into the car to three vacuum motors located under the drivers dash ,toward the center.If you notice the vacuum line is cracked or burned/melted then vacuum line needs to be replaced.But if the vacuum line is intact then it can be issue with vacuum motor or problem with vacuum line hose/.Its loose or cracked/worn out.